When The Library of Fragrance launched in the UK I was most definitely curious about some of their more unusual scents and made sure I headed in to Boots to have a sniff. If you haven't heard of The Library of Fragrance before they're a New York based company that launched under the name of Demeter Fragrance Library Inc. Demeter's products are sold in over 35 countries and have recently made it to the UK as The Library of Fragrance. What is unusual about their fragrances is that they're all quite unique featuring singular scents such as Dirt, Black pepper, Fresh hay and Marshmallow. They have over 300 fragrances, 101 of which came over to the UK (there may be more now due to new releases) and they're available through their UK website and a smaller selection are also available in Boots stores. 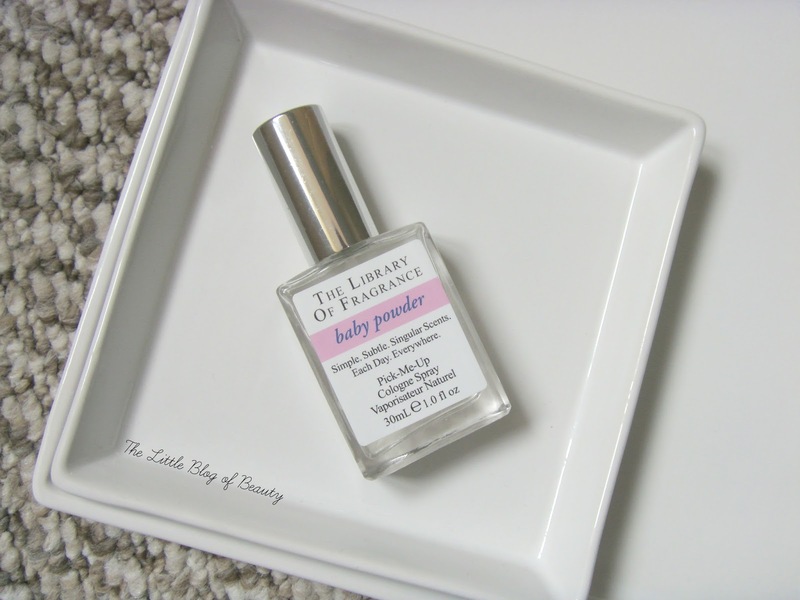 Earlier this year there was an opportunity through Hayley's blog London Beauty Queen to get your hands on a generous sample of two of their most popular scents; Baby powder and Thunderstorm. I popped in my details but unfortunately missed out on the samples as demand was high. However, the lovely people at The Library of Fragrance asked me what my top three choices would be (Baby powder, Clean skin and Marshmallow FYI) and they kindly sent me Baby powder* to try. As soon as I saw that they had a Baby powder scent I knew it was one I wanted to try as I'm a big fan of Yankie Candles Baby powder candle. Their scents fall into various different categories and this is one of the 'clean' scents along with Fresh laundry, Mountain air and Salt air. Don't they all just sound amazing! The bottles are very simple and all look the same with the only difference being the scent name on the label, which is over a colour that in most cases appears to represent the scent. The bottles are glass and contain 30ml. As you might expect this is quite a delicate, powdery scent and it does smell exactly like Baby powder. It's the sort of scent that I find quite comforting and I can imagine squirting myself with this after having a bath before wrapping up in a blanket to watch TV in the winter. I nipped into Boots and tried layering this with Clean skin and it smells amazing. Well, that is if you want to smell like a freshly washed baby! It's probably not the longest lasting of fragrances but I can still smell it if I give my wrists a sniff after a few hours and the compact size means this is one you can drop in your bag to top up through the day. The Library of Fragrance colognes are £15 each from The Library of Fragrance website and in Boots stores, but if you do buy them in Boots you'll get two for £25. Have you tried any of their unusual fragrances? The lovely ladies did the same for me and I chose Peach! I'm a huge fan of these fragrances! Oh my they sound amazing! Im going to have to go in to boots and try I think! I haven't tried any of these yet but I am going to - I really want a chocolate one!